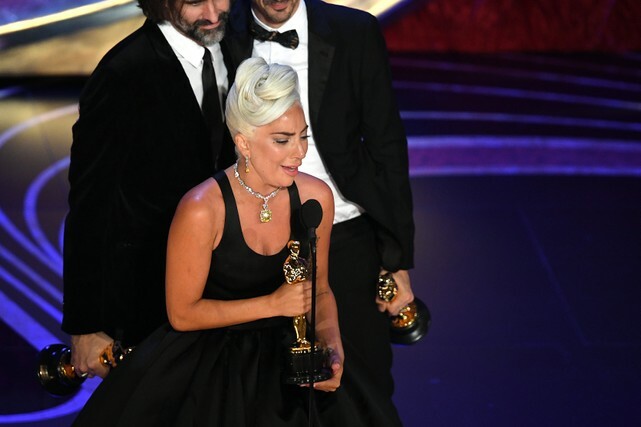 A Star Is Born hit “Shallow,” written by Lady Gaga, Andrew Wyatt, Anthony Rossomando, and Mark Ronson, and performed by Gaga and director Bradley Cooper, has won the Academy Award for Best Original Song. The winning song faced stiff competition this year. The full list of nominees included The Ballad of Buster Scruggs’ “When a Cowboy Trades His Spurs for Wings,” Black Panther’s “All The Stars,” Mary Poppins Returns’ “The Place Where Lost Things Go,” RBG’s “I’ll Fight,” and, of course, A Star Is Born’s “Shallow.” The Coup’s “OYAHYTT” from Sorry To Bother You and Thom Yorke’s “Suspirium” from the Luca Guadagnino horror remake Suspiria were both shortlisted in the category but did not earn nominations. Gaga and Cooper performed the Oscar-winning track earlier tonight. The Academy originally planned to cut back on Best Original Song airtime by eliminating performances of all but two of the category’s nominees (“All The Stars,” and “Shallow”). The Oscars rolled back those plans in the wake of immediate backlash, giving performances back to the nominated songs from The Ballad of Buster Scruggs, RBG, and Mary Poppins Returns. Kendrick Lamar and SZA eventually bailed on their performance of “All The Stars,” but the show compensated by adding an opening number from Queen as a tribute to Best Picture nominee Bohemian Rhapsody.